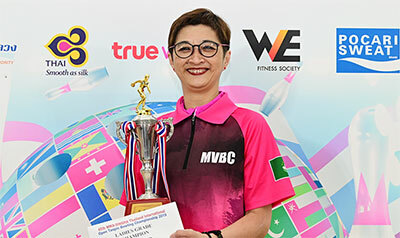 11th April, Bangkok: Chanasorn Wutti of Thailand captured his first international title with victory in the Men's Grade B Master finals of the 45th MWA-Singha Thailand International Open at Blu-O Rhythm & Bowl Ratchayothin. Macau veteran, Wong Wan Ip set the early pace with a sizzling 234 in his opening game to lead Thailand's Nattawong Choitkijkornwiwat by a single pin with a second Thai, Udomrat Tawatpalangkorn registering a big game of 221 for third. But Wong could not maintain his fast pace slipping to second as China's Lu Ze Jiang added a stunning 242 in the second game to his 206 opener to take over the lead. Lu continued his relentless pace with 203, 195 and 235 in his next three games to open up a 65 pin gap. Chanasorn took over second and trailed the Chinese as Wong continued to fade off. Lu rolled 214 abd 204 in the sixth and seventh game but found his lead reduced dramatically to just two when Chanasorn fired two huge games of 234 and 247. 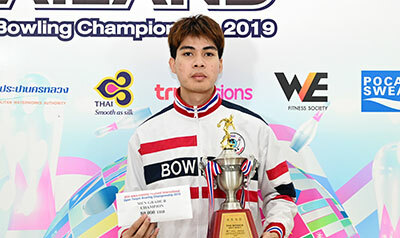 The 21-year-old Thai rounded off superbly with 235 to clinch his first international title with 1732. Lu stumbled to an eighth and final game of 186 to settle for second position with 1685. His compatriot, J.Y. Liang finished third with 1636. Chanasorn picked up the top rpize of 80,000 Thai baht (approx. US$2,500) and a trophy for the victory. Lu and Liang took home 40,000 and 20,000 baht respectively. Prizes were awarded up to 13th position. Meanwhile in the Ladies' Graded division, Macau's Alex Foo took the crown with 1538 after taking over the lead from the third game onwards. Qin Xiu Li of China, who set the early pace, finished second with 1525. Thailand's Ramita Sarntong and Sariya Chongvarin took third and fourth spots with 1493 and 1478 respectively while Vietnam's Ha Dieu Huong completed the top 5 with 1454. Foo earned 40,000 Thai baht (approx. US$1,250) as champion. Qin and Ramita settled for 20,000 and 10,000 baht for finishing first and second runners-up. Prizes were awarded up to seventh position. Thai Tenpin Bowling Association committee members gave away the prizes to the winners. Senior and Men's Grade A Masters finals will be staged later today. The qualifying rounds divided into three squads, consist of three blocks of five games each totaling 15 games will be contested over the next three days with the finals scheduled for April 15.